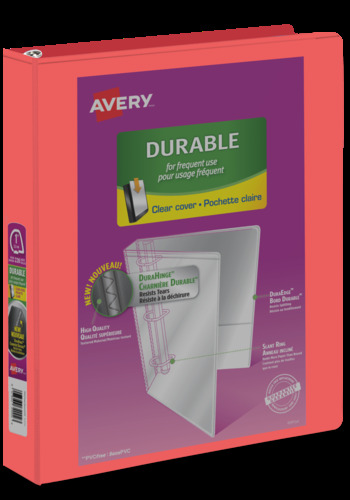 Avery® Durable View Binder , 1”, Slant-D Ring, Coral, 1”, 8½" x 11"
1", Slant-D Ring, 8½" x 11"
Organize by colour! These stand out shades make it quick and easy to identify different subjects or projects. They not only look great, they are built on a Durable frame, so they are made to stand up to the toughest assignments! Organize by colour! These stand out shades make it quick and easy to identify different subjects or projects. They not only look great, they are built on a Durable frame, so they are made to stand up to the toughest assignments! The DuraHinge design is stronger, lasts longer and resists tearing, and the DuraEdge feature makes the sides and tops more pliable to resist splitting. Our deep texture film offers a smoother finish and features a linen pattern for a high-quality look and feel. Two interior pockets help you organize and secure loose papers, and the slant rings hold up to 220 sheets; a higher page capacity compared to same size round rings. Avery's 100% satisfaction guarantee ensures that if any binder is not to your satisfaction- we will replace it!